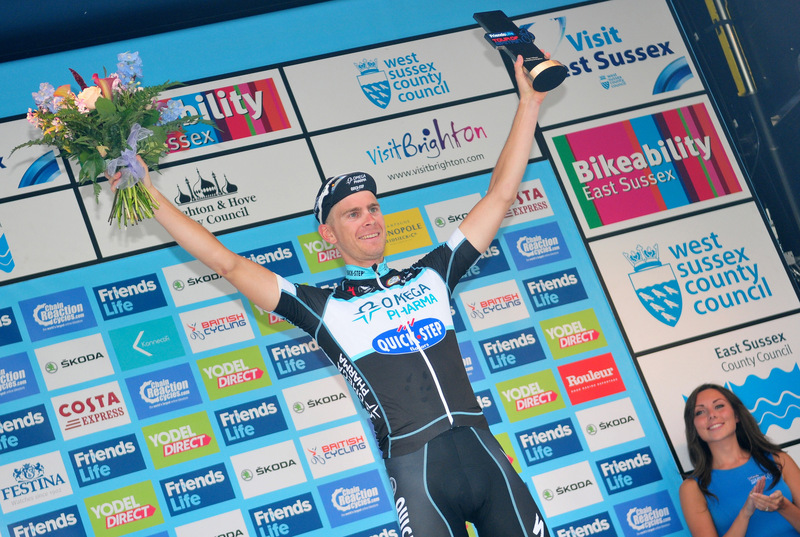 Julian Vermote won on the seafront in Brighton after being out in the break almost all day on the longest stage of the race. Fellow escapee Dylan Van Baarle (Garmin-Sharp) becomes the second man in two days to take the race lead from the breakaway. Ignatas Konovalovas (MTN-Qhubeka), Kevyn Ista (IAM) and Marcin Białobłocki (Velosure-Giordana) were also in the break but were dropped as the decisive moves were made. 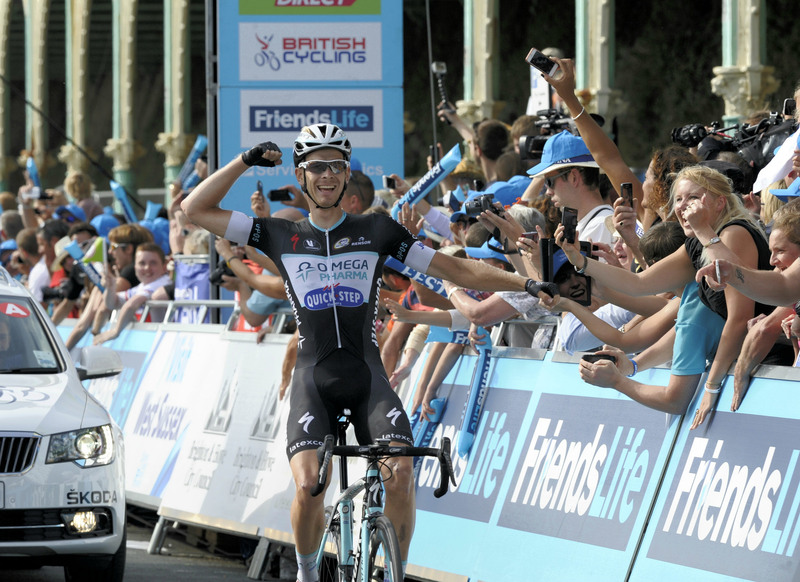 Like yesterday, the maximum gap was ten minutes as Omega Pharma-QuickStep struggled to contain the breakaway. After ceasing his work after 140km Vermote attacked on Ditchling Beacon and never looked back, finishing 23 seconds ahead of Konovalovas and Van Baarle. The peloton came in 1:20 down after a frantic chase over the first category climbs in the closing kilometres. What was left of the peloton was shattered on Ditchling Beacon, with yellow jersey Alex Dowsett on the wrong end of the split. Brad Wiggins, Edoardo Zardini, Nicolas Roche and Michał Kwiatkowski were safe in the front group as the gap back to Dowsett grew. The man from Essex lost over a minute to the other GC men and falls to tenth overall. Young Tao Geoghehan Hart did a great job to stay with the GC men but flew into the barriers as he tried to lead the group around the final hairpin bend. It looked horrific but he will continue. Meanwhile Kwiatkowski led the group across the line and now lies 19 seconds behind Van Baarle ahead of tomorrow’s race-deciding time trial. Really tired. It was a pretty hard day, we went almost from start to finish full gas and when I crossed the line I was completely dead. Yeah, I like this time trial distance the most. I’m not a Wiggins that needs 50km or whatever. I’m more a prologue specialist. I don’t know how the legs will feel tomorrow for the other guys and it will be hard tomorrow. I wanted to show my name a little bit, show myself, but I didn’t expect to be wearing the yellow jersey. Before the race I was thinking about top 10, top 15 and now I’m thinking about the podium or maybe winning. I’m a bit surprised because only one day I didn’t ride at the front of the peloton. Actually, every day I felt I recovered quite well. I went into the break and I felt immediately I had a good chance because yesterday the break was 10 minutes in front and I know how hard it is to chase it down, particularly yesterday. I know my place in the team because with all the good riders I like to help them. But yknow its also nice if you can finally win a stage. Also, I’m really happy that finally I finally got the red number of Rouleur. I really wanted that this week – I saw it every day. Again it was a tough day. Its a hard race, harder than expected. I don’t know about the finish because the last 20km were easy for me – I think I’ve had enough pain for this week. For me it was a really successful week – it was great this week. I think that the one week races are good for me. If I rode for the general I could’ve got top 10. More important for me and the team was 2 stages. Lets see what the future brings but I think I have a good engine and could also win one week stage races. The Worlds TT is a real goal for me. I have trained for that. Tomorrow I’ll have to see. The last two days were really hard and I suffered a lot. I don’t know how explosive I am but tomorrow we will see who managed to recover best. I’d like to try my best in the time trial. It won’t be as hard in the afternoon. Today was a very hard stage with a lot of hills and we rode the last kilometres au bloc. I’ll go to the Worlds for sure because I’m National Champion. I hope I can do the best result like last year because last year I was 11th. I hope I can be in the top ten. If I have good legs maybe better. I tried to attack the last climb but the climb is too short to make a difference. The legs were good but there was a breakaway. We tried, but yeah, its good. We had Zardini in very good condition. Tomorrow we can do a good time trial with him. The sprint is for Ruffoni. We can try in the afternoon with him. The deciding stage of the Tour of Britain is an 8.8km time trial from Whitehall to Tower Hill and back. The big question is whether neo-pro Dylan Van Baarle can hold on to his 19 second lead over pre-race favourite Michał Kwiatkowski. Its a totally flat course, and not technical at all, as the majority of the stage is a straight run along the Thames. The obvious favourite is Michał Kwiatkowski. He can do a bit of everything and this short TT is perfectly suited to him. In-form Matthias Brändle took it easy today and he told me he will go for it tomorrow. The short distance isn’t ideal for Brad Wiggins but he is the best pure time trialist here. Alex Dowsett is in good form but has been going all out for a couple of days now. Jan Bárta was third in the Tour’s final TT and said he will test himself here as he builds for the Worlds. Sylvain Chavanel hasn’t been too noticeable in the race but he’s strong against the clock too, while Steve Cummings is another good time trialist. Nicolas Roche will be looking to move onto the podium, though he’s hardly noted for his skills in this discipline. Race leader Dylan Van Baarle will be motivated and has said he liked the course so it could be a close one. The roads used in the TT get another pounding as the 2014 Tour of Britain finishes with a ten lap criterium around London. There are three sprints along the way and if the GC time gaps are still close after the morning stage then we could see a battle for the win. Otherwise, it should be a standard sprint stage as we saw in Liverpool. Marcel Kittel is the strongest sprinter in the world and we might finally get to see him go head to head with Mark Cavendish. 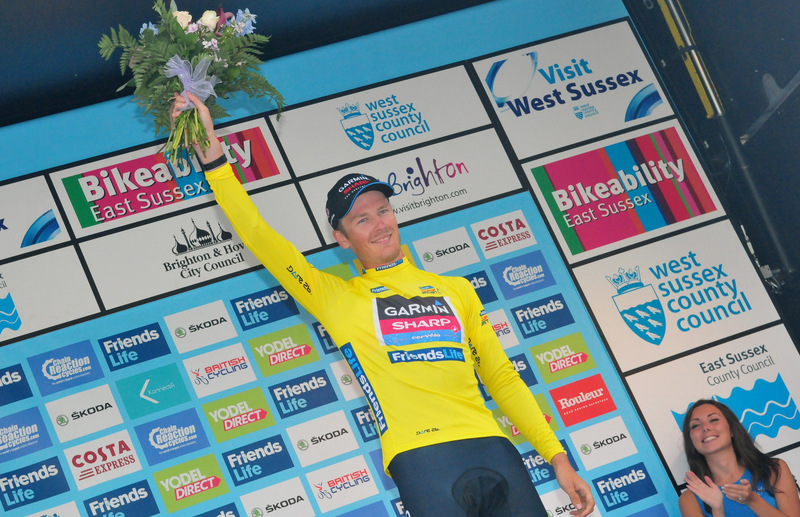 Ben Swift has been consistent and just lost out to Mark Renshaw in Llandudno – the Australian should take over if Cavendish gets into trouble. Nicola Ruffoni is the fastman from Bardiani-CSF and was runner-up on stage one. Heinrich Haussler and Tyler Farrar are both good riders who have never managed to recapture their best form.